Click to enlarge full cover. Back Cover Endorsements:“A wonderful selection of first-rate essays on one of the most important principles of civilized life—cooperating with people instead of controlling, taxing, dragooning, bullying or bombing them. Bravo, Skyler Collins!” – Lawrence W. Reed, author of Striking The Root, and president of the Foundation for Economic Education. “This book contains a very useful, well-organized, and carefully selected set of essays centered around the idea of human liberty, what Hazlitt called ‘cooperatism’ [Foundations of Morality, p. xii] and what the editor calls ‘voluntaryism.’ In addition to covering the basics of politics and economics, the book contains a large number of essays devoted to education and parenting. This decision makes perfect sense, when we realize that our children and the ideas they are exposed to are the greatest hope for liberty in generations to come. I highly recommend this excellent volume, for beginners, activists, and seasoned libertarians.” – Stephan Kinsella, author of Against Intellectual Property, and director of The Center for the Study of Innovative Freedom. Edited by Skyler J. Collins, Foreword by Chris R. Brown, PhD. – Amazon.com in paperback ($14), Kindle ($2.99), or Audiobook. – Lulu.com in ePub ($2.99). – Large Print Edition, 8.5×11, CreateSpace, Amazon. “There is no more appealing social vision than that of a world organized on the basis of peaceful, voluntary cooperation. 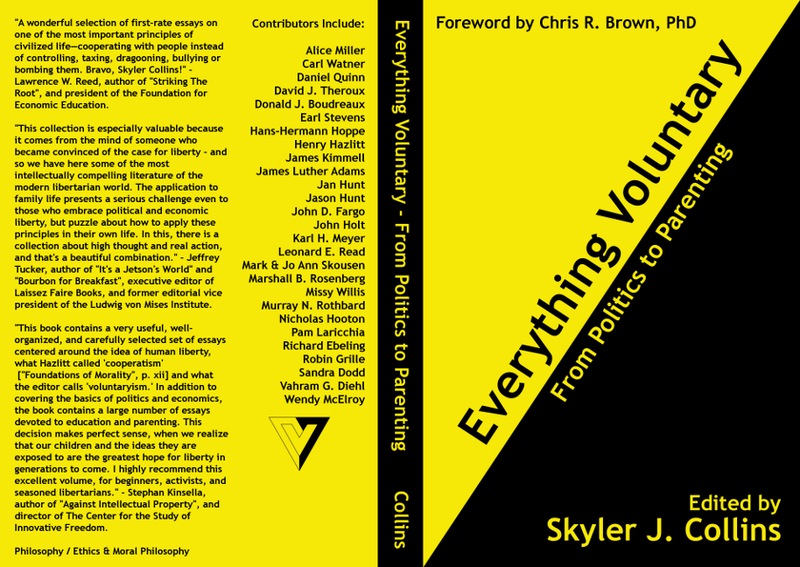 In Everything Voluntary, Skyler Collins has collected essays by a variety of thinkers—including well-known libertarian theorists and others who deserve wider recognition—committed to enlarging our understanding of the nature of such a society and the paths we might take to reach it. The essays here are especially noteworthy because of the breadth of their focus: discussions of religion and child-rearing rarely figure in libertarian conversations—though they should do so much more often—but Collins has ensured that those interested in thinking about these topics will have lots of food for thought. Everything Vountary is well worth the time of anyone who cares about realizing the ideal of peaceful, voluntary cooperation.” – Gary Chartier, author of The Conscience of an Anarchist, co-editor of Markets Not Capitalism, and Associate Dean at La Sierra University. “The ideals that each person pursues in their life, such as prosperity, liberty, health, morality, and wisdom, can only properly be achieved through peaceful means. Any amount of unjust coercion to achieve these goals tarnishes whatever brilliance they might have otherwise had. Frédéric Bastiat once observed that the state is the great fiction by which we each try to live at one anothers’ expense. Our ideal, then, should be its opposite: the individual pursuit of excellence only through peaceful means, and its promotion only through persuasion. Skyler Collins’ new book compiles a variety of helpful and thought-provoking essays to help the reader ponder how to remove coercion from their lives and live peacefully. Anybody will benefit from considering its content, but more importantly society as a whole will benefit from its concepts being implemented and encouraged.” – Connor Boyack, author of Latter-day Liberty, a Gospel Approach to Government and Politics, and chapter coordinator of the Utah Tenth Amendment Center. “I loved the range and scope of this freedom anthology that Skyler Collins has created. For those who wonder about where voluntaryism begins and ends, this book shows that it encompasses practically everything – hence the title. The various articles within shed lots of light on many key topics, including the roots of coercion found in education and parenting. As noted, it’s here that the seeds of a peaceful and prosperous stateless society will be sown. The reader will encounter many libertarian classics as well as many articles that aren’t so well-known, but are nonetheless tremendously insightful. Some of the writers don’t explicitly advocate a stateless society and reveal faulty premises at times, but one will find much common ground in their overall promotion of human freedom. 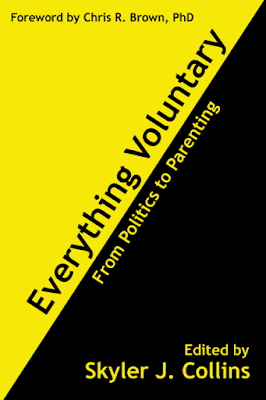 Ultimately, this book explains why all our lives are immensely enriched by applying voluntaryist principles.” – Wes Bertrand, author of The Psychology of Liberty and the CompleteLiberty.com podcast. “Skyler Collins has assembled a great panoply of voluntaryist literature for the curious reader. From the basics of ethics to the details of parenting, these collected essays have the potential to change your entire perspective on life itself — for the better!” – Norman Horn, PhD in chemical engineering, founder and chief editor of LibertarianChristians.com, and blogger at The Libertarian Standard.